BRIBOSIA, E., et RORIVE, I., “Reasonable Accommodation Beyond Disability in Europe”, European Network of Legal Experts in the Non-discrimination field, European Commission (Directorate-General for justice), September 2013. The European Network of Legal Experts in the Non-discrimination field has published a new thematic report entitled “Reasonable accommodation beyond disability in Europe?”. The authors, Emmanuelle Bribosia and Isabelle Rorive, examine to what extent the concept of reasonable accommodation which is currently limited to the ground of disability under EU law can be and has been extended to other grounds of discrimination. The report demonstrates how the concept was developed in the United States and in Canada before analysing the case-law of the European Court of Human Rights as well as EU law. 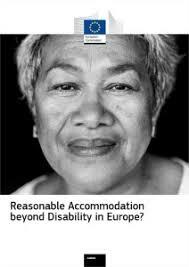 Finally, the report examines how some EU Member States already accommodate other grounds than disability, such as race/ethnic origin and religion or belief, and provides an analysis of how such accommodation can be successful.